Amazing breakfast - and beautiful rooms - Crazy value! A lovely surprise! We'd never stayed in a Varsity Club before - it's been so nice. I think we're spoiled! Clean, reasonable, good breakfast, nice lounger area. Great staff. The staff came to the room with extra towels and helped lower the heat setting for the room. Pleasant, helpful staff. Clean and comfortable, got in at 1am the desk clerk was very considerate and gave me a late check out. I was very grateful for that. Hotel was generally ok for the price - room had a funny odor to it - do not think it was cigarette smell. The room was grubby and smelled like smoke. The beds were clean and comfortable. It’s ok. We only stayed for one night just enough to get some rest. There is fun to be had for all ages in South Bend. After all, it is the fourth largest city in Indiana. Although it does not cover a huge area, there are plenty of attractions and activities to enjoy in this metropolis and surrounding suburbs. The city feels intimate and welcoming, with a distinct community spirit and relaxed vibe. Whether your ideal day consists of strolling around museums, catching a show, or watching sports at a well-equipped venue, you will surely find your groove in South Bend. 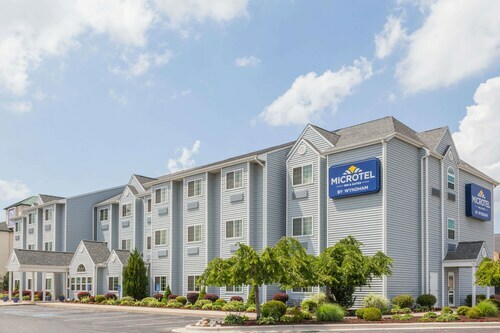 Hotels in the Notre Dame area take advantage of being near to the youthful student areas of the city, such as the University of Notre Dame and St Mary’s College. This means that there are a variety of fun bars and restaurants, as well as a great social scene in this neighborhood. Also in the area, you can find the Notre Dame Stadium, the Basilica of the Sacred Heart, and Hesburgh Library, making Notre Dame a fantastic place to stay if you are a lover of culture and history. Downtown South Bend is the perfect place to stay if you are traveling with kids. Attractions in the area encompass the Potawotomi Zoo and the South Bend Chocolate Factory, which are interesting and entertaining for both children and the young at heart. In case you are looking for somewhere to stay a bit out of the city, opt for the area by Potato Creek State Park. A little more rural, it is a fantastic spot for those wanting a more relaxed vacation or those keen on experiencing nature. If you want to stay out of the city but do not wish to sacrifice on any conveniences, consider a hotel in Ardmore, located in the suburbs. It is a shopaholic’s heaven, with Concord Mall situated nearby, offering some of the best retail therapy Indiana has to offer. South Bend is ideal for the more budget conscious traveler. With 23 3 star hotels to choose from, which come at a range of prices, you can enjoy a variety of facilities and different locations, depending on your preferences. This way, you can be sure to find your perfect hotel in an area of the city to suit you. 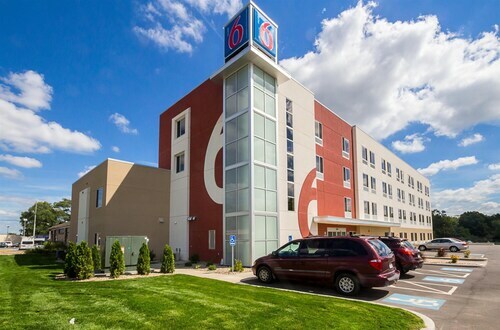 For a work-related visit, look into business hotels in South Bend>. If you are visiting South Bend for business, you can choose from famous brands which will ensure you have a seamless time in the city, or opt for something more personal by picking a local hotel. Moreover, there are pet-friendly hotels all over South Bend, with plenty of options to suit different budgets and tastes. This means that you can bring your pet along without sacrificing on your trip requirements. You and your furry friend will have the best time. South Bend International Airport lies an easy three-mile journey northwest of the city. Its most popular destinations for domestic flights include Las Vegas, Atlanta, Newark, Detroit, and Chicago. However, it also flies to international destinations. Should you want to stay near the airport, there are a few hotels near South Bend International Airport to take advantage of. This is an excellent budget property Clean, safe, friendly.